Right, just to get it out there: I’m done with all the healthy stuff. Done. As in: I’m never going to make a healthy dessert again ever in my life! Sure the garam masala popcorn was healthy, but that was good. 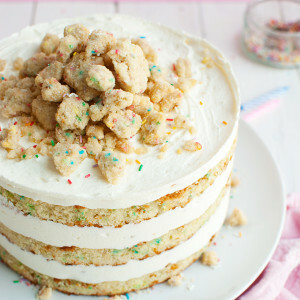 Plus, it doesn’t count as dessert, because it’s a snack. And snacks are allowed to be healthy. I mean, hummus is healthy. Olives are healthy. And hey, a spoonful of peanut butter is kind of healthy, right? Yet I was tricked in believing that there are actually healthy dessert options! Last Saturday, when my 2 oldest nephews and my little brother were coming over to watch ‘The Wolverine’ and eat pizza, I made a chocolate avocado mousse. Like I said, I don’t count calories myself, so I wasn’t intrigued because it was healthy. No no… I was just struck by a healthy sense of curiosity. I mean, chocolate and avocado? Naturally, I believed that it was going to be delicious. Why would I think otherwise? Chocolate has always been the magic word when it comes to sweets, cookies, cakes and desserts in general. Chocolate is the magic is many cookie recipes. It is one of the most popular ice cream flavors. And most importantly, chocolate can make an average (or healthy) dessert amazing, right? Well, it turns out it can’t. All of us hated it! And that was even before we stuffed our faces with pizza, cookies and popcorn! Like I said: I’m done with healthy desserts. 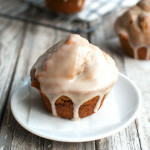 So I made these Caramel Apple Muffins! 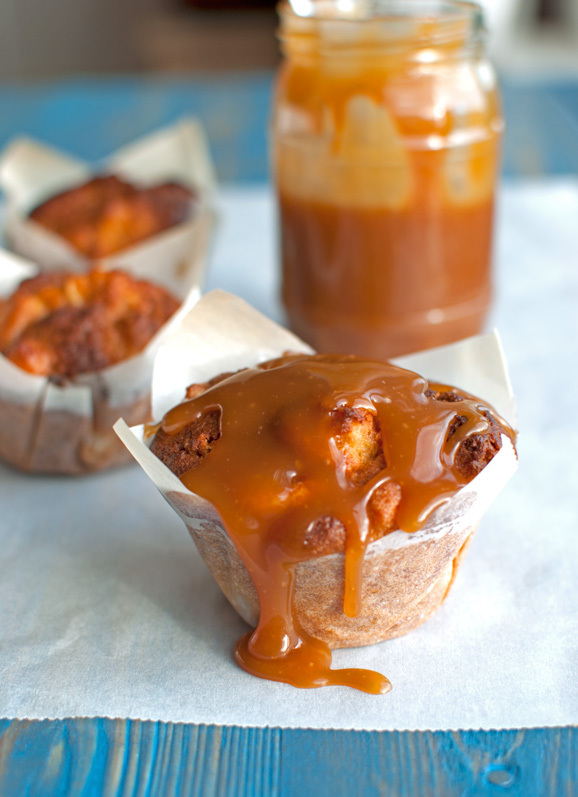 Delicious, cinnamony muffins with big chunks of tangy sweet apple and drizzled with a generous – like: GENEROUS – amount of salted caramel sauce! These are just perfect. I know, because – unlike that horrible mousse – everyone loves these! Once again I have half a jar of leftover caramel sitting in my fridge right now! Except maybe my chocolate mousse recipe! Oh, by the way, ‘The Wolverine’ was fun. Plot-wise perhaps a bit disappointing – why doesn’t this movie pick up where X-men Origins left off? – but Hugh Jackman’s arms and shoulders make up for that! 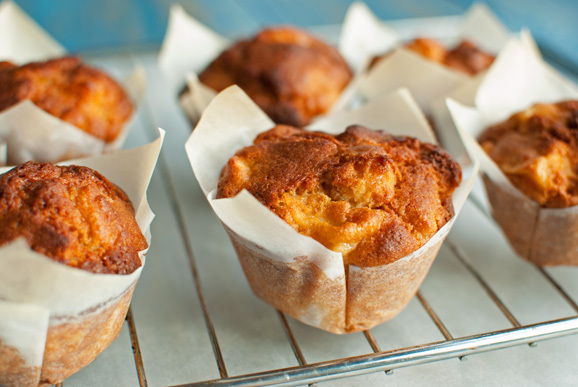 Preheat the oven to 225°C or 440°F (standard oven setting) and line 6 muffin cups with muffin liners or make your own out of baking parchment (check out 'Homemade Muffin Cups' under 'Basics and Tips'). Whisk together the eggs, oil, Golden Syrup and vanilla extract. Add the flour, sugar, baking powder and cinnamon and whisk to a smooth, thick batter. Peel and core the apple and cut it into little pieces, then toss with the half tablespoon of flour until coated. 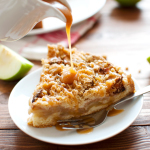 Using a rubber spatula, stir the apple pieces into the batter. 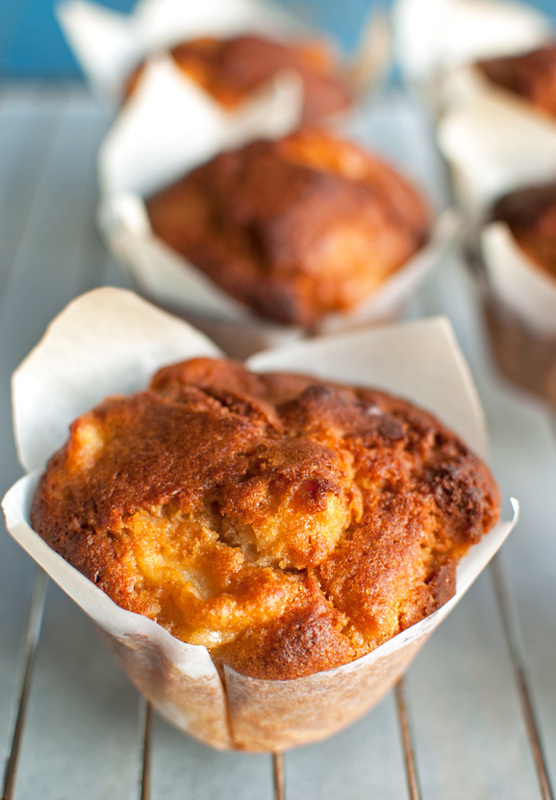 Divide the batter over the lined muffin cups, filling them all the way up. Bake for 8 minutes, then open the oven door and turn the oven down to 175°C or 350°F. 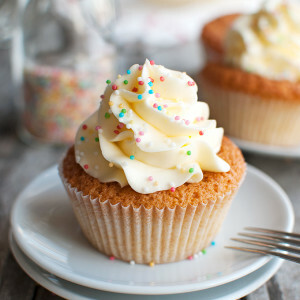 Help the oven to cool down by fanning it with a tea towel for a couple of minutes (until the oven has come down to the desired temperature) and bake for another 25-30 minutes, or until a tester inserted in the center of the muffins comes out clean. NOTE: my oven has an indicator light which turns off when my preheating oven has reached the set temperature. I use this light as an indication of the oven temperature when I'm cooling the oven down. Once the light turns on, I know the oven temperature is just under 175°C (or 350°F), at which point I close the oven door and let the muffins cook for another 30 minutes. 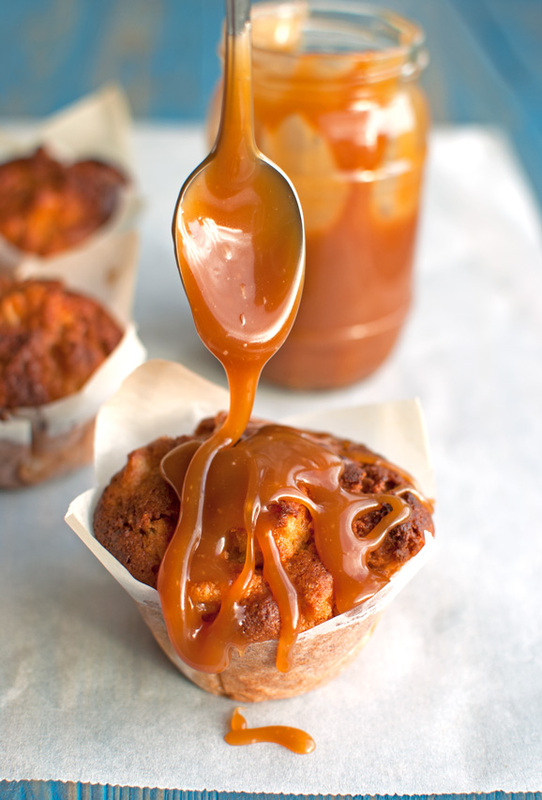 While the muffins are in the oven, make the caramel drizzle. First, stir the salt into the cream to dissolve it. Set aside. Prepare a water bath in your sink or on the countertop by either filling your sink with a few inches of cold water or filling a large pan all the way up with cold water. You will use the water bath later to cool down the caramel. Add the sugar to a medium-sized saucepan. Heat over low to medium-high heat, stirring with a rubber spatula, until the sugar starts to clump together. Keep stirring and eventually the clumps will melt into an amber-colored caramel. Some of the clumps may take their time melting into the caramel. Be sure to crank down the heat if this happens, otherwise the caramel might burn before the clumps have completely melted. Once all of the sugar has melted, add the butter and stir. Be careful, because the butter will bubble and sizzle once you've added it to the hot caramel. Stir with a rubber spatula (wear oven mitts, as the butter may splatter) until incorporated. This may take up to 2 minutes. Add the salted cream to the caramel (again: be careful, as this will bubble violently!) and stir to combine. Allow to boil for 1 minute, then take the pan off the heat and dip the bottom of the pan into the prepared water bath. This cools down the caramel and stops the cooking process. If you were to skip this step, the caramel continues to cook as it cools, which may result in an unpleasantly bitter, dark caramel. Stir with a rubber spatula to knock some of the heat out, then pour the caramel in a heatproof container. Allow to cool to slightly above room temperature before using. 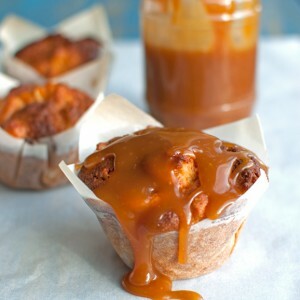 Once the muffins and caramel have cooled, drizzle the muffins with a generous amount of caramel and... Enjoy! 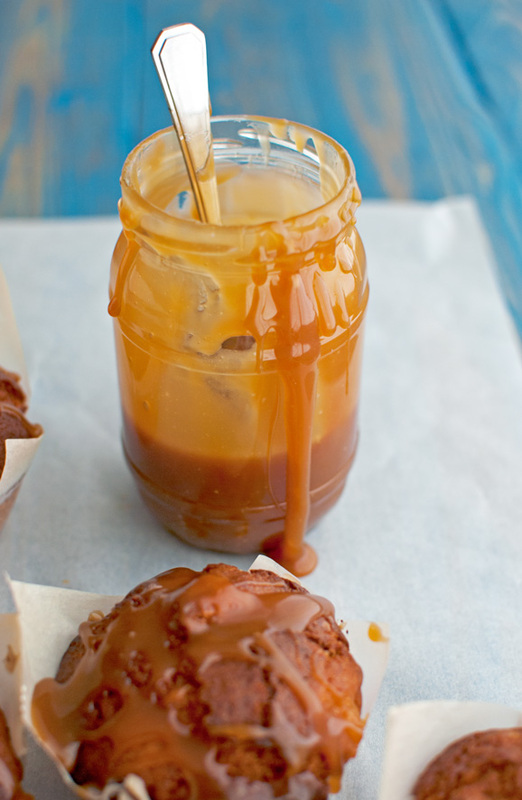 i love the ooey gooey caramel! Thanks Dina, that’s exactly what lured me into making these 😉 It’s just perfect with the tangy sweet apples! 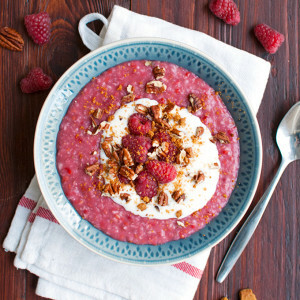 That sounds so good – and wonderfully not good for you!